Change has come upon our world in Africa at such a rapid pace that we need wisdom to know how to handle it. To illustrate it with my own life, my grandfather did not go to a formal school. My father went up to grade two while I have earned a PhD. These changes have happened in a span of about 120 to 150 years. I need to know how to communicate across this span and divide. About 12 years ago when I left Kenya to study in the United States, very few people in Kenya had cell phones. After 6 years when I came back everyone had a cell phone—even the lady who sells vegetables in the market and the herdsman in the remotest village. One grandmother over 75 years old has a cell phone and uses it to communicate with her son in the United States. In fact I had to be taught how to handle these new gadgets. People would not believe that one who had been living in the first world was so ignorant in this simple matter. Now, this rapid change would be easy if it was only touching on mechanical things, but unfortunately, it affects relationships and the social fabric that holds the society together. I will illustrate this change with three scenarios that touch on very fundamental relationships in the human community, in marriage and the place of women, raising children, and relationships with neighbors. In traditional African societies, marriage was not for the individual alone. It was entered into from the very beginning as a communal affair right from the negotiations to the marriage ceremony itself. This is because marriage and family was the foundation for the society as a whole, so it would not be entered into lightly. Once the marriage was ratified there was no divorce and it was not just “until death do us part” since one did not marry the individual but also the community. Here is a case of one of my cousins. She was married at the age of 18. She did not complete high school and was married for 25 years. Her husband died two years ago. She has five children—four are still in high school. In traditional African society, she would have been inherited by her brother-in-law who would have taken good care of her in meeting her social, sexual, and economic needs. But with the rapid changes, this system has been corrupted so that if a brother-in-law came into the picture he would only exploit the widow and misuse her resources. This has caused many women to refuse to be inherited. But what are the options open for such a lady who has no economic base to meet her family’s needs? She asked me for advice the other day. She said according to the church she is free to remarry, but according to the African traditions she is not allowed to remarry because she is married to the clan of the husband. If she found a husband, how would that happen—especially with the belief in the community that “one cannot receive bride-wealth twice”? Such things do not happen. If she engaged in some affair with a man without the intention of marriage what would that be called, an “extra-marital, post-marital affair”? That alternative was not open to her as a Christian. But she has such dire economic needs due to poverty. How does she meet them? There is no man who would really want to marry her with five children and take up the burden of raising them with the cost of paying fees for those who are still in high school. But if perchance she found someone to marry then there is the added danger of HIV and AIDS. Men, however, do not face such a dilemma. They can remarry at any age a woman of their choice. This is not an isolated case. There are many such ladies who are caught between the rock and a hard place. How does a pastor preach on 1 Corinthians 7:39 on the fact that widows can remarry in this context? The second scenario is about Rachel, a fourteen-year-old girl in the streets of Eldoret. Both parents have died due to AIDS. Her relatives disowned her and did not want anything to do with her after her parents died. The only option was for her to come to the streets of Eldoret so that she could get something to eat. Fortunately, before she got involved in the street life of sniffing glue or child trafficking, she was rescued by one of the organizations known as Berur Street Care. There are many like Rachel who for one reason or another are on the streets. They cannot stay with their relatives because they take advantage of these children. In traditional society the ties for the community were strong and no child was left to wander. The relatives cared for this child in the extended family system, but now with rapid change, resources are so scarce that the extended family is overstretched and these children are left in a vulnerable state. That this system has broken down is evidenced by the number of street families in all the towns of our cities in Africa and more specifically in our context in Kenya. Uasin Gishu Children Services Forum [UGCSF] brings together service providers and organizations including charitable homes, health and education providers, and environmental and social service providers to create awareness of challenges facing families living on the streets in Eldoret—the administrative center of the Uasin Gishu district of the Rift Valley Province of Kenya. The efforts of UGCSF are directed at providing basic needs, jobs, and identity cards for distressed families, as well as working with other advocates, local chiefs, children’s offices, and universities to assist street families. The network encourages cooperation, shares ideas and experiences, facilitates training, and shares best practices. 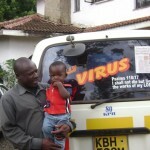 Photo: a FORUM member “living positively with AIDS,” pictured with his son. He uses his matatu (taxi) to send messages to the community about positive living and preventing HIV/AIDS. I work with Uasin Gishu Children’s Forum, an organization that brings together all the institutions who work with vulnerable children in Eldoret and the greater Uasin Gishu region. Until 2006 there was no such body and everyone worked independently. Thanks to research funds from USAID-HED that brought the Universities (Moi, Daystar, and University of Southern California) to work with these organizations in order to see how to respond more effectively to this great need in our cities. In 2008 when Kenya was engulfed in post-election violence, these institutions stood together as a symbol of unity when the country was being torn across tribal and ethnic lines. African culture is very welcoming. In many homes there is hospitality and welcome for strangers. In fact, in most African languages the word for “stranger” is the word for “guest” as well. Whenever food was prepared there was a small portion known as kimyet ab lakwa meaning the food for a child, but it was kept aside in case someone showed up after the meal. However, with the changing of the times the practice of hospitality, especially in the urban centers, has been difficult to carry on. One challenge is one of insecurity. Those who are being welcomed are not always genuine people. There are cases where one has been welcomed and the household has woken up to find they have been cleared of their possessions. This has led to the extreme reaction we now see in most Kenyan urban centers. Residential areas have high concrete walls and maximum security gates to keep strangers away. The common sign on the gates is mbwa kali meaning “fierce dog.” When I see these signs and the high walls, it breaks my heart because we have come too far leaving our values behind. The unfortunate thing is that the thieves have found that these high walls do not keep them away. It only means that the next neighbor can be robbed without the other knowing what is happening. So the African wisdom of security in numbers is still valid. Another thing that touches on African hospitality is that it was regulated with wisdom sayings such as Mgeni siku ya kwanza siku ya pili mpe jembe, meaning a guest is a guest only for a day or two but if they stay longer then they should participate in the household productively. This has not been practiced well in our urban centers. Many take advantage of well-off relatives, thinking that they can be continuously provided for. They assume that it is their right to receive and demand help and so they just perpetuate a culture of dependency. There is a tendency always to look for handouts. In fact, our leaders in politics have taken this to the extreme because they just give handouts to receive votes and do not emphasize hard work. In the light of these challenges that face us in the rapidly changing world, how do we practice Christian convictions of caring for the widows, for the orphans, and the strangers? The word of God tells us “the least of these” are the bottom line checklist to show that the society is concerned for its weak persons. Within the African system was built the concern and care for these people. But with the changing times many are falling through the cracks. How can we retain those structures in the light of changing times? How can we care for “the least of these” yet be cognizant of the dangers of the present times? Or do we abandon these high ideals and live on the adage “Everyone for himself and God for us all?” How do we preach the Word of God faithfully in changing times so we can preserve with integrity the values of God that have been embedded in our community, while at the same time embrace change? God’s wisdom is about rebuilding walls and traditions that helped to keep the families and communities together. It is about finding relevant substitutes for times that have changed. The wisdom that the student of preaching requires in these changing times is to be a reader not just of two worlds, i.e., the world of Scripture and the world of the hearer, but to realize that the man and woman in the pew have multiple worlds to contend with. They have the rapid modern technological world and also the remainder of the traditional customs and practices to preserve identity with. In order to help these people navigate between these worlds the preacher needs three things. Moi University is one of seven public institutions of higher learning in Kenya, West Africa. Located in Eldoret, 310 kilometers northwest of Nairobi, the University was the second in Kenya to be established by an Act of Parliament—the Moi University Act of 1984. At the time of its inception, Moi University was mainly an institute for science and technology courses with a relatively small number of arts courses. The first cohort of 83 students was admitted in 1984 through a transfer from the Department of Forestry, University of Nairobi. Since then, the university has experienced growth from its initial faculty member in 1984, to a total of 934 faculty, 12 schools, and 5 directorates in 2010. The university currently operates three campuses (Main, Town, and Eldoret West); 4 constituent colleges (Kabianga, Chepkoilel, Narok, and Karatina); and 7 satellite campuses, (Nairobi, Kitale, Kericho, Southern Nyanza, Odera Akang’o, Coast, and Northern Kenya campus). Eldoret is a rapidly growing industrial town and gateway to central Africa. Its location, claims the university, enhances interaction between researchers and the rural community and promotes cost-effective implementation of outreach programs for sustainable development, such as health education and intervention, legal aid clinics, and fish farming. The mission of the university is “to preserve, create, and disseminate knowledge, conserve and develop scientific, technological and cultural heritage through quality teaching and research; to create conducive work and learning environments; and to work with stakeholders for the betterment of society.” Total student enrollment is over 22,000 registered in 297 programs, consisting of 90 undergraduate, 134 master of philosophy, 61 doctor of philosophy and 12 postgraduate diploma programs. First, one needs wisdom in connecting people with the God who is the same yesterday, today, and forever. We need to see that the God that our ancestors believed in—the one who built in the structures of care for the widow, the stranger, and the orphan—is the same God, the God of Israel. This is the same God that is the father of our Lord Jesus Christ who has said that he will never leave us nor forsake us. This God even speaks our language in the Bible translations of our mother tongue. That is the reason for the overwhelming response to the preaching of the gospel in Africa. Second, there is need to show the interconnectedness and interdependence in the family of God. There is neither Jew nor Gentile, neither slave nor free, neither man nor woman, because we are one in Christ. This same God has brought us into a family that is not just confined to our own people. We have brothers and sisters and members of the household of God that are scattered all over the world. We have our relatives and people who are next of kin wherever we go. This group solidarity was clearly demonstrated by the Maasai of Kenya when they heard of the tragedy of Katrina they sold their cows and made donations to the people in the United States. Third, we need to show that this God is concerned with every sphere of life. There is no sphere that is outside his control: not politics, not education—not even our cows. This was demonstrated in the prayers of our people: Asis tukwon lagok ak tuga, “God protect my children and cattle,” and Asis konech sopon, “God give us life.” He is concerned about all our needs, whether appeals for reform in our governments so that corruption is eradicated or the care of widow and the orphan who have no food. We can reach him at any time, unlike our modern phone lines which get jammed and we get the disappointing response mteja hapatikani, meaning “the subscriber cannot be reached.” This is our God, and we are glad to be called by his name. 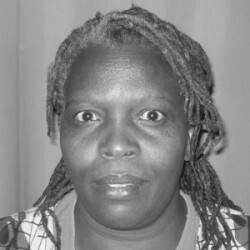 Emily Choge-Kerama, PhD, is a senior lecturer at Moi University, Eldoret, Kenya. She also prepares pastors and leaders in the ministry through Nairobi Evangelical Graduate School of Theology. She is cochair of the Uasin Gishu Children’s FORUM, that brings together organizations that work with vulnerable children. She is a founding member of African Christian Initiation Program (ACIP), a group that helps young people transition successfully from childhood to adulthood.